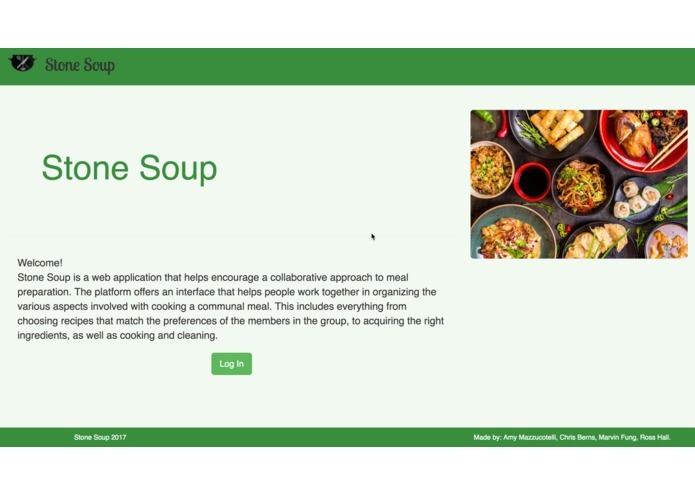 Stone Soup is a web application that helps encourage a collaborative approach to meal preparation. The platform offers an interface that helps people work together in organizing the various aspects involved with cooking a communal meal. This includes everything from choosing recipes that match the preferences of the members in the group, to acquiring the right ingredients, as well as cooking and cleaning. I primarily worked on front-end such as components on the front page and researched elements to display. I worked on the landing page and initial back end using Firebase. I was project lead for this project, responsible creative vision and technologies used.